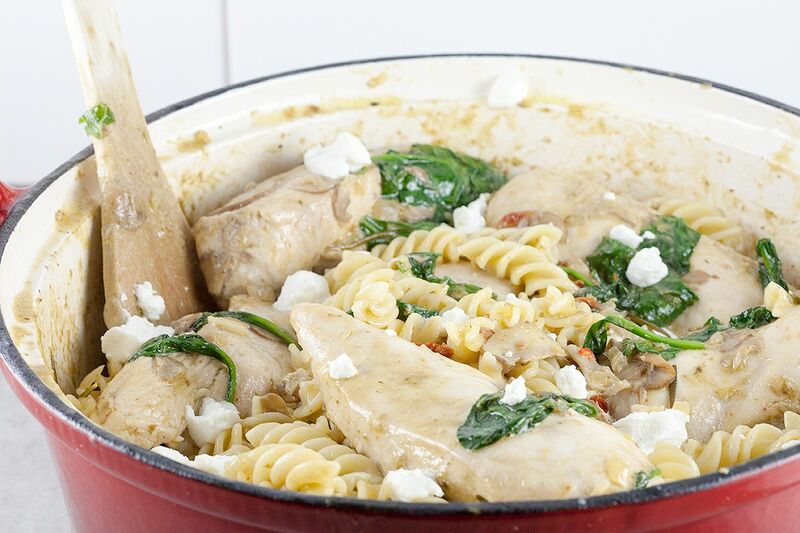 A fragrant, creamy chicken pesto pasta with baby spinach and big pieces of chicken will surely feed 4 people easily. Ready in 30 minutes. CLEAN, stem and slice the chestnut mushrooms. RID the chicken breasts of any excess fat or blood, slice into two halves and season with salt and pepper and set aside. WASH the baby spinach and haricots verts. DICE the onion and chop up 2 cloves of garlic. ROUGHLY chop up the sun-dried tomatoes. You can optionally cook the haricots verts if you want, we did this too and it’s really an addition to the dish. All you have to do is to heat up water in a small pan until it boils. BLANCH the haricots verts for 4-5 minutes, then set aside. Serve the finished dish with the haricots verts on the side. COOK fusilli pasta according to package directions, drain and set aside. MEANWHILE cook the sauce. HEAT up 1 tablespoon olive oil and 1 tablespoon butter in a large skillet. ADD sliced chestnut mushrooms, diced onions and chopped garlic and cook for 4-5 minutes, while stirring now and then. TRANSFER mushrooms from the large skillet into a bowl. 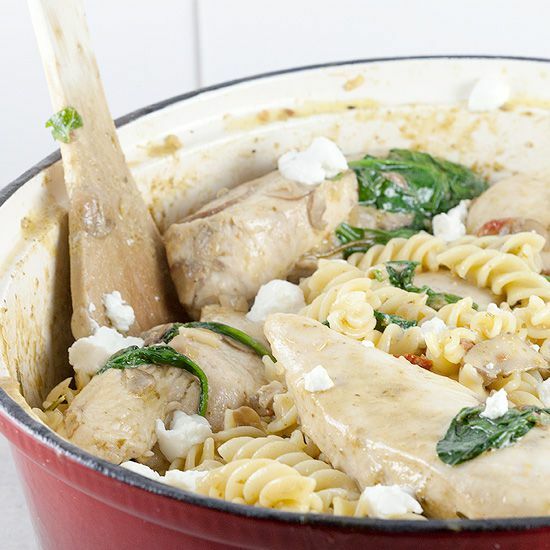 HEAT up another tablespoon olive oil, add chicken, place lid on top of it and cook for 12-15 minutes on medium heat. 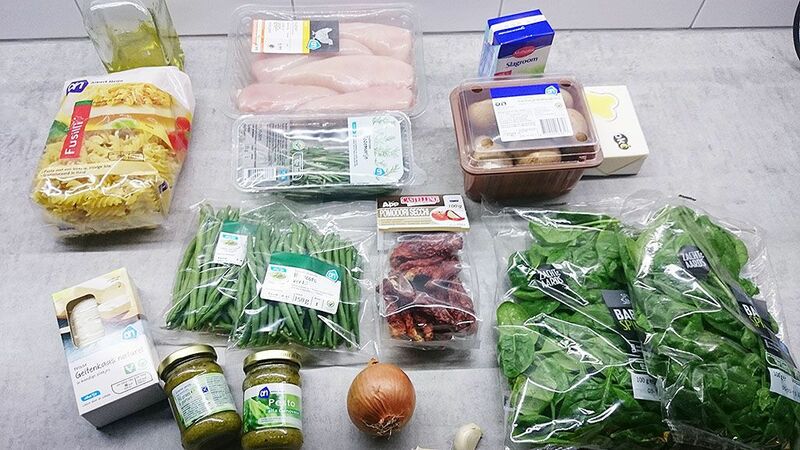 TURN the chicken breasts once when not pink anymore. REMOVE chicken from the skillet and transfer to a plate. ADD cream into the large pan or dutch oven. WHISK in the pesto and add in chopped sun-dried tomatoes. ADD mushrooms and chicken breasts into the sauce, mix to coat. COOK for 3-5 minutes or until the sauce has thickened. MIX in the baby spinach, wait for it to shrink a little then add in the fusilli pasta. HEAT UP until the entire dish is hot again, serve with crumbled goat cheese and chopped flat leaf parsley.